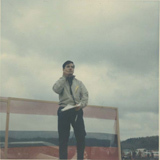 That first air show was done on the fly, so to speak, and Danny was dressed in casual clothes. But Danny was already thinking about the Hollywood thing. He believed that the industry needed to be elevated to get the respect it was due. After all, he has always believed that "we're entertainers first and pilots second." He thought that dressing like a celebrity would, if they were the master of ceremonies, just make the whole thing more Hollywood. And so, the Danny Clisham signature suit was born. The first suit, at his second air show, was grey. Then came a dark blazer. The white suit was much later. People often ask him about the boutonniere. That's easy. The boutonniere came from Jackie Gleason. Jackie would come out to host his show with a pocket hanky and a boutonniere. He looked like he cared about his audience. It was just a class act. Danny thought, "if it works for him, maybe it could work for me." 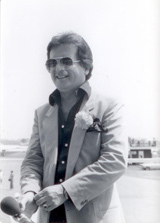 In fifty years of air show announcing, Danny has certainly seen a lot. He is often asked if there is one person or one event that stands out in his mind, and is quick to say, "No. There are so many dynamic performers that have been able to accomplish things even my wild mind couldn't conceive. They certainly bumped up the industry in terms of entertainment value, skill and professionalism." When forced to pick one, he says that there have been people in every calling - producers, skywriters, wingwalkers, pilots, designers and builders - who have left something lasting behind for the air show industry. But the biggest change he's seen in the past fifty years is in the crowd. The crowds are bigger and more diversified every year. That came from quantum thinking by people like Rick Grissom and others who brought in the corporate aspect with chalets, corporate sponsorships and company events. That really helped to bring out people who would have never thought to come to an air show by themselves. And that has helped shows to build up loyalty and develop a tradition that keeps people coming back to a show year after year. There have been a lot of changes in technology since the 60's. But the one thing that has had the most impact for Danny is the professional outdoor sound systems used now, with professionals at the helm. Danny's personal air show world is better if the crowd can get a clear picture of the pilot. If he can't get the message out about all the great and talented people he works with, it's all lost... Says Danny, "Waldo Pepper had to do it with a bullhorn. I get to do it with state-of-the-art communication equipment!" And, being recognized by the people he admires the most is probably the most gratifying. "Collectively, I'd say the Sword of Excellence and the Art Scholl Showmanship Award are my proudest accomplishments - just to know that some people thought I was worthy. I wasn't ready for either and I was surprised by both. But those awards led me to believe that for all these years... at least I was on the right track." That was twenty years ago, and he had been announcing for 30 years. He said then that he wanted to be doing this for another 30 years. "I just have the most fun, and get such a kick out of it; I hope I'm announcing air shows way into my 80s." All of Danny's professions have been extensions of his hobbies. He still has a lot of fun with general aviation airplanes and he is very intense about live performances - "they just recharge me. I would encourage everyone in our business to go out and see as many live performances as they can - concerts, opera, theatre, the orchestra. Even if you think it will be boring, you'll always see something you can learn from about showmanship, practice, and sacrifice. The more you can incorporate from what you see, the more you'll enhance your own performance." Danny's advice for up-and-comers is simple. "If you want to be an airline pilot or an air show performer or a competition pilot or anything, here is my blanket statement. It works for everything, it's simple, it will never change and your success is guaranteed: Choose something you have a passion for, and work to get just a little bit better at it every day."